80,000 year ago a primitive tribe desperately guards its most valued possession, fire. They know how to tend it, how to use it, but its creation remains a mystery. During an attack by a neighbouring tribe their flame is lost and so begins an epic, obstacle-filled quest to find another source of the element so precious in their struggle for survival. Having first made his name on the international curcuit with his Oscar-winning Noirs et blancs en couleur / Black and White in Colour, French director Jean-Jacques Annaud (The Name of the Rose , Seven Years in Tibet , Enemy at the Gates) cemented his reputation with what remains one of his most fascinating and adventurous films, the story of prehistoric man's relationship with fire told without recogniseable dialogue and with a cast chosen partly for their simian facial characteristics, including Ron Perlman (Cronos, Hellboy), Everett McGill (Twin Peaks), Michael Gruskoff (Young Frankenstein) and Rae Dawn Chong (Commando). This multi-award winning film had its own special primitive language created by distinguished writer Anthony Burgess and the body language and gestures were choreographed by renowned zoologist Desmond Morris. 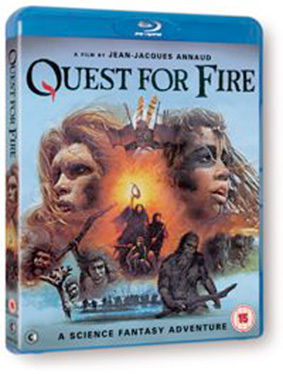 Quest for Fire will be released on UK Blu-ray and DVD on 5th August 2013 by Second Sight at the RRP of £15.99 for the DVD and £19.99 for the Blu-ray.